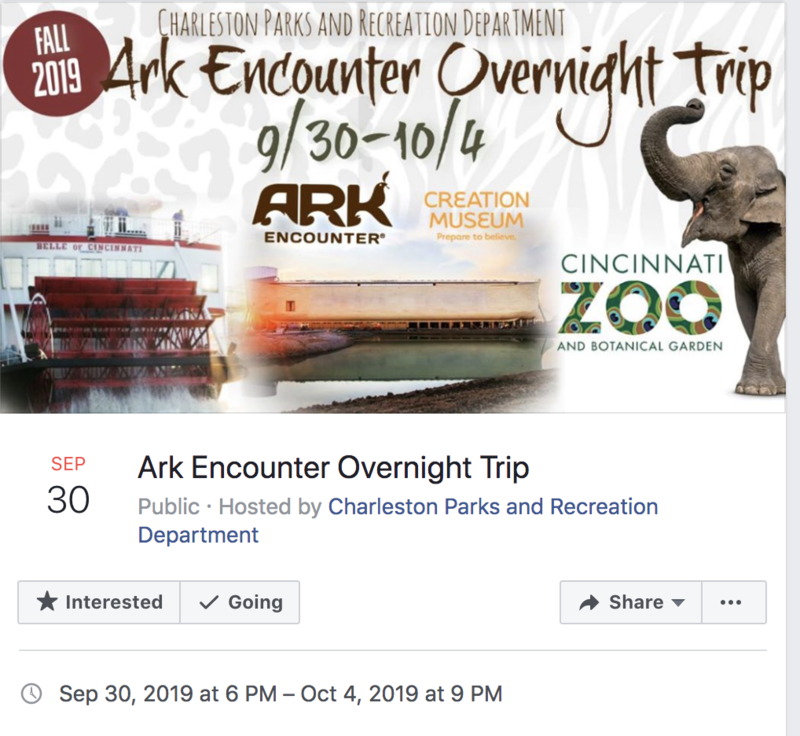 The Charleston, Illinois Parks and Recreation Department is giving local citizens the opportunity to visit, yes, Ken Ham’s Ark Park and Creation Museum. 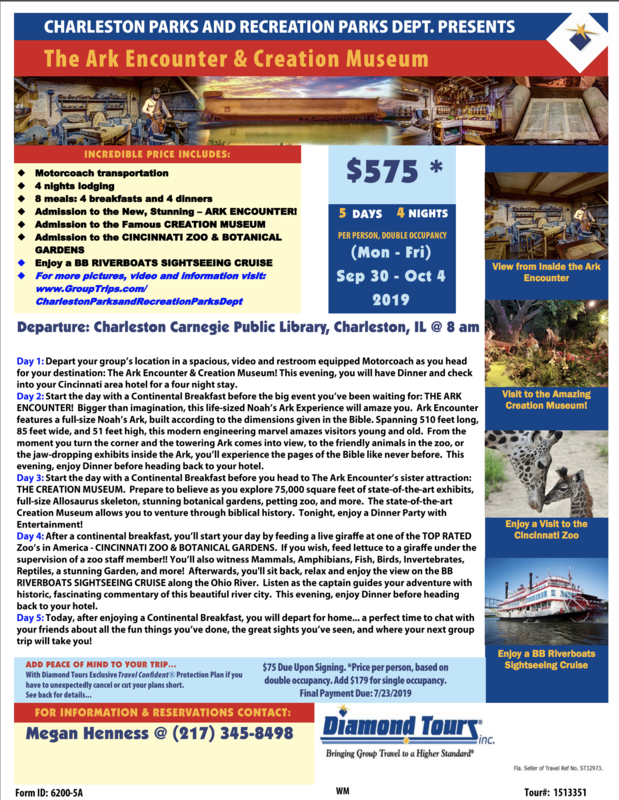 The links are below, and there’s a fee for the trip, but that doesn’t matter: it violates the state sponsorship of religion prohibited by the First Amendment. It’s like a city government sponsoring a trip to mass at the local Catholic church. And their contact information, including Facebook messaging. This entry was written by whyevolutionistrue and posted on December 3, 2018 at 11:30 am and filed under First Amendment, Intelligent Design Creationism Watch. Bookmark the permalink. Follow any comments here with the RSS feed for this post. Both comments and trackbacks are currently closed. Time for another brick in the wall of separation. Hey, Creationists just wanna have fun. The FFRF should look into this. I guess that the organizers of this trip had no idea that a first amendment issue is involved. I am also guessing that in that part of Illinois, creationism is so universally accepted that no one thought twice about visiting Mr. Ham’s museum. As an aside, Charleston, Illinois was one of the sites for the famous Lincoln-Douglas debates of 1858. I sent it to the FFRF, as usual with these things. My guess is that no one cared. Creationism isn’t as widespread as people think, and civil servants aren’t as diligent as we’d like them to be. My guess is someone saw “Museum”, went “Yeah, that sounds educational”, and ran with it. Not sure I agree. I see the First Amendment as requiring the state to view religion as they would any other organization. 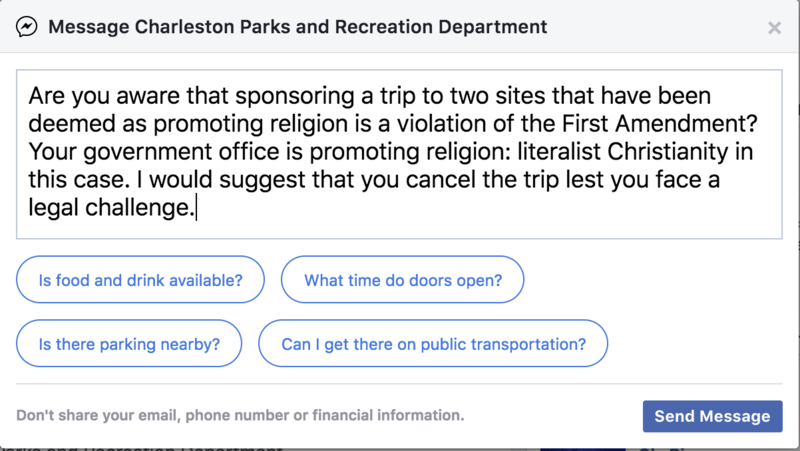 If Illinois has a procedure in place for organizing and/or subsidizing trips, and that procedure does not give preference to religious organizations, then I do not see this as a First Amendment issue. Exactly- how far does the First Amendment go? I don’t know! That is a decent argument, but I suspect it would not hold up. The itinerary is to visit a number of sites, including the Creation Museum, and it looks like that will happen without provision for an alternative site. So those going on the trip are technically coerced into at least going onto the grounds of the CM. To me that reads as entanglement in an established religion. Also there is a clear preference to the Judeo-Christian religion here since they are not also visiting a Buddhist temple. The question isn’t the content, but rather the procedure. If the government approved this BECAUSE it was based in religion, that would obviously be a First Amendment issue; if they approved it WITHOUT REGARD TO its basis in religion–in other words, if they treated it like any other group requesting their assistance–it’s not. It’s like with Christmas lights in many public parks: Anyone can set up a display, as long as they fill out the paperwork and follow certain rules. The fact that some groups who do so are churches is irrelevant; the government does not discriminate for or against any group on the basis of religion, only on the basis of clearly-defined, secular rules. The government doesn’t care if it’s a church or a bank that puts up the displays. The fact that Christianity is heavily represented, while, say, Wicca or Islam are not, is a matter of demographics, not government intervention. What you’re arguing is, at least as far as I can tell, the equivalent of the government saying “Anyone can put up whatever light display they want in the park–except religious organizations, you are forbidden from doing so.” Why, under the First Amendment, should religions be excluded from activities allowed to, say, museums, private companies, student clubs, and Boy/Girl Scouts? You make some good points with respect to allowing groups to use public property for that kind of display; the government may not favor one religious display over another. But the government may not ALSO contribute to the display in any tangible way (except as part of their duties as owners of the property (road maintenance, etc) as that can be viewed as endorsing a religious view. This sponsored trip to Idiot Ark, however, is manifestly different; the government is taking part in the trip. They are sponsoring it, they are providing logistics and administrative services for it and they are pinning government’s name to it. This is as clear a violation of the 1st as any. The first image has a picture of Cincinnati Zoo on it as well. I assume (perhaps wrongly) that Cincinnati Zoo is a wholly secular organisation and “promotes” ToE. Prior to their arrival, will the Cincinnati zoo cover up all signage related to evolution and to time spans greater than 6000 years?